I have been plagued with hair fall issues for the longest time – way before I met John, my hair was in a MUCH MUCH worse condition where there are prominent bald spots which placed my confidence level at its lowest. I think there isn’t anything I can lie, exaggerate or cover up about this because all those who have seen me know HOW bad it was. My photographers especially, Melvin from Multifolds and Fiona from Smittenpixels always have to patch up (digitally enhanced) the bald spots of my hair otherwise it is….that obvious in photos. 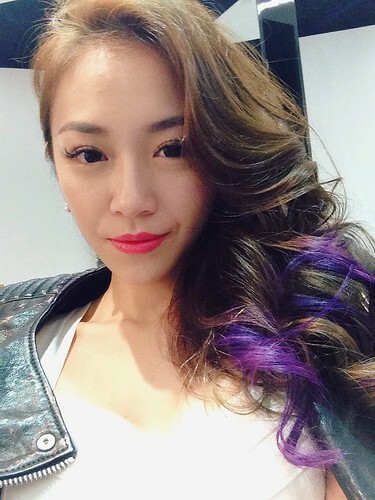 The reason for hair fall is due to stress from work and lack of sleep. Additionally, the improper meals meant my body was not able to repair itself with sufficient nutrients . All these factors contributed to my hair loss and it resulted in significant bald patches near my temple. Here is a photo showing the drain in our house previously when I was experiencing really bad hair fall – before I started really caring for the well-being of my hair and scalp. 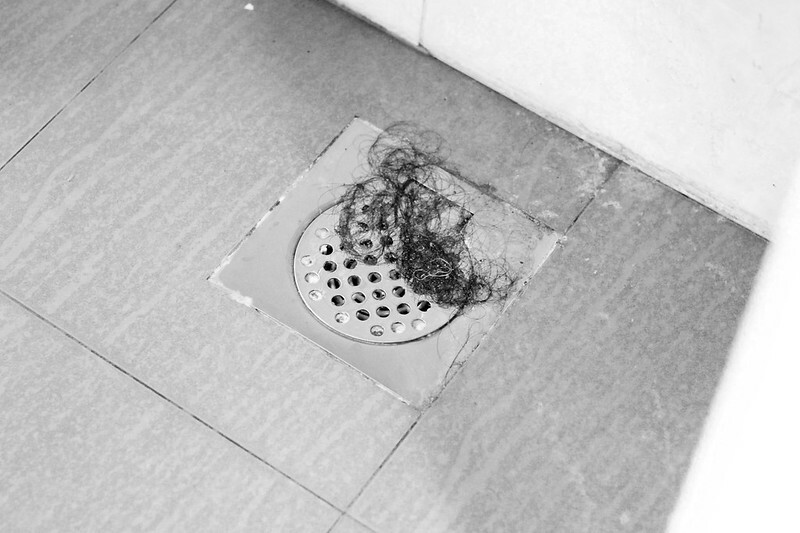 It is funny how we experience hair fall but body hair doesn’t seem to shed on its own….if only they do. Through alot of hard work and taking advice from John (Hey he’s like a doctor! ), baby hair is sprouting from all the bald spots and I am taking even better care of my hair now. This is so as to maintain the condition of my scalp so hair fall can be prevented. Once the loss of hair reduces significantly, it can only mean the condition of your scalp is getting better and problems such as oiliness, dryness are kept at bay so your hair have a clean and healthy canvas to grow out healthy and strong. It is said that you lose up to 100 strands per day and that adds up to 3000 strands a month. As such, the use of the right shampoo and conditioner are highly important for the upkeep of the scalp. I tend to alternate my shampoo, conditioner and masque after 2, maximum 3 bottles. So given the opportunity, I jumped at the chance to review L’Oreal Paris Fall Repair 3x range which consists of a shampoo, conditioner and ampoules treatment. This range has 3 ingredients that work together to form its Triple-action Formula. Aminexil, an ingredient which is typically only found in professional salons as a form of treatment, is now made available to the mass market thanks to L’Oreal. With two other potent ingredients, known as Arginine and Protein, it targets hair fall at the root of the cause – largely due to lack of nutrients and hair breakage. With this in place, L’Oreal Fall Repair claims to save 1600 strands of hair per month. As for me, I use it as a form of intensive treatment therefore I try to use one treatment bottle per day. I am on my second week for this now and Anti Hair Fall range is looking good for me up till now. Previously, I have been through other scalp-targeted treatments as well and find that these are a specifically targeted form of treatment which works to strengthen individual strength of hair strands where the product gets delivered directly onto the scalp and into the follicles. This can only mean every hair strand will get restructured from within thanks to the active ingredients which was administered directly. The shampoo is extremely creamy and comes with Loreal’s signature floral scent which is light on the senses. It can be easy to stray from this regime and skip applying the treatment but trust me on this, be disciplined on using this treatment system daily and you will begin to see results after 1 month. I love how the texture of the shampoo is silky smooth and creamy because I love bath and body indulgence products which usually comes with really inviting scents. Similarly, this range has a light flowery scent just like most of their products which sits really well with me so thumbs up for its texture and smell! If you are facing issues such as oily scalp and hair fall, I would recommend this range for those with oily scalp as it leaves my scalp feeling clean without the tightness and the oiliness is reduced as well. The best way to tell whether this works for you is keeping track of the amount of hair you drop BEFORE you start and AFTER you use this system.